Ok guy's I know this has been covered, but I finally received my Hammerli X-Esse yesterday. Love the feel of the pistol. I have CCI SV ammo but actually prefer to use HV if possible. I know the SV is so much more accurate but I am shooting steel plates for the most part with it so HV is accurate enough. My question is the manual say's it is rated for HV and SV ammo lr. I know the Trailside' s have had some trigger housing breakage, I have not heard of the Walther made Hammerli' s having this problem. Has anyone shot a steady diet of HV ammo through one of these yet ? Will the Trigger housing hold up? I have a 2x scope mounted on it after running 20 test rounds through it for function test. Thought that I was going to just use irons but I think the scope will be really nice since my eye's are not the best anymore. Pictures to come soon. 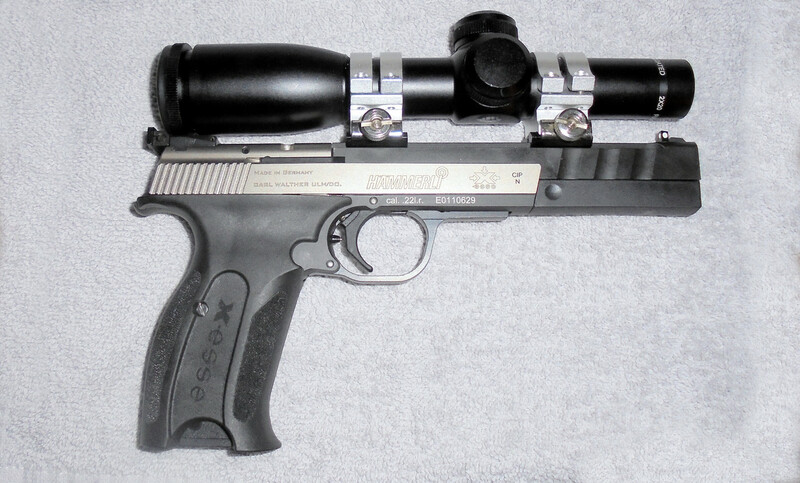 X-esses will also break the trigger guard if not adjusted correctly. The process of bending the trigger guard to have minimal gap to the frame to act as a slide stop is fiddly. You'll have a temptation to trim the front tang of the trigger guard to resemble a 208/215 guard. I've only shot standard velocity in my X-esse and have broken the original guard. I hate to hear that. I looked at the tab that sits against the frame. I did a little filevwork to attempt to get it against the frame with no luck. I never did get the tab against the frame. If you have the nerve you can put the guard in a vice and squeeze it together just a bit to move the recoil tab to the rear. I believe I will just shoot it. The manual says that you can shoot HV so that is probably going to be a steady diet for it. If the trigger guard breaks I will buy two for replacement and try bending one of those. I shot her today with the scope getting it sighted in. Shot SV to sight her in then shot the last 10 rounds of Federal Hollow point HV. She shot great.